Many serial protocols used for chip-to-chip communications are very similar to the ‘Serial Peripheral Interface’ (SPI). This paper shows how to use SPI Storm custom protocol engine to define and use a serial protocol that is different from SPI. 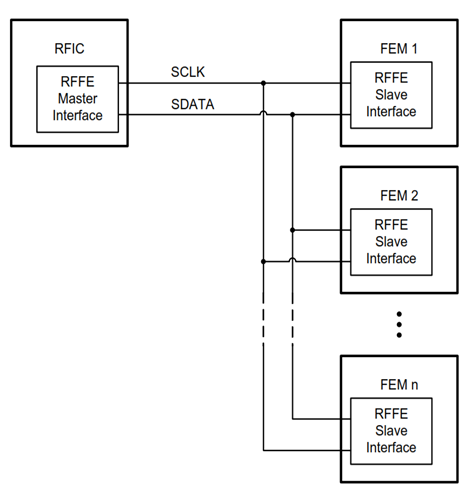 The MIPI RF Front-End (RFFE) Control Interface is taken as an example. The ‘MIPI’ (Mobile Industry Processor Interface) Alliance (www.mipi.org) is an organization that develops interface specifications for the mobile industry. It was founded in 2003 by ARM, Intel, Nokia, Samsung, STMicroelectronics and Texas Instruments. MIPI specifications provide interface solutions for mobile handsets. MIPI is divided into multiple working groups. The MIPI RF Front-End working group’s scope is to define and standardize control interface solutions for RF front-end components and modules. This covers numerous front-end devices including power amplifiers, low-noise amplifiers, filters, switches, power management module, antenna tuners and sensors. The RFFE Control Interface is a master-slave two wire interface composed of a single bidirectional data line and a clock signal generated by the interface master. It runs up to 26 MHz and can count up to 15 slave devices per bus master.